Today’s Free App of the Day is an engaging and adorable sharing app that was tailor-made for preschoolers. Sharing With Duckie Deck offers 6 fun mini-games, reading-free game play, and totally cute graphics. Sharing Games for Preschoolers is a collection of beautiful learning games for children 2-5 years old. Our games will engage your toddler or preschooler and make him smile, while teaching him why sharing is so important and how to make it fun in everyday life. ✓ Win Win – share your happiness and victory! ✓ Pie In The Sky – take turns, decorate a cake and munch away together! ✓ Gimmie Gimmie – share your dreams and wishes! ✓ Scribble & Dribble – draw and paint beautiful pictures together! At Duckie Deck we provide smile. Over 8 000 000 toddlers played our games and smiled. We teach things that are important for their future, things that matter to their parents. 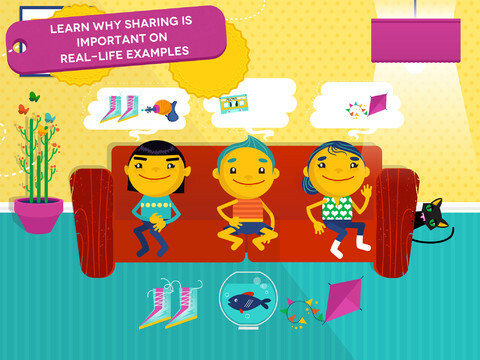 We explain why sharing with others is so important. Why we should brush our teeth and what does friendship mean.